In 2016, the Federal Bureau of Investigation reports that only 29.6 percent of robberies, 20.4 percent of larceny-thefts, and 13.1 percent of burglaries were cleared by arrest or exceptional means. You may be reviewing this data and applauding the FBI’s work. At Firstline Locksmith, we appreciate everything the FBI, CIA, local police, and various other authorities in our government accomplish on a daily basis. It’s phenomenal. However, we also see something else in these statistics. The overwhelming number of uncleared crimes. Some of them can be prevented altogether, especially for retail businesses in Hamilton. 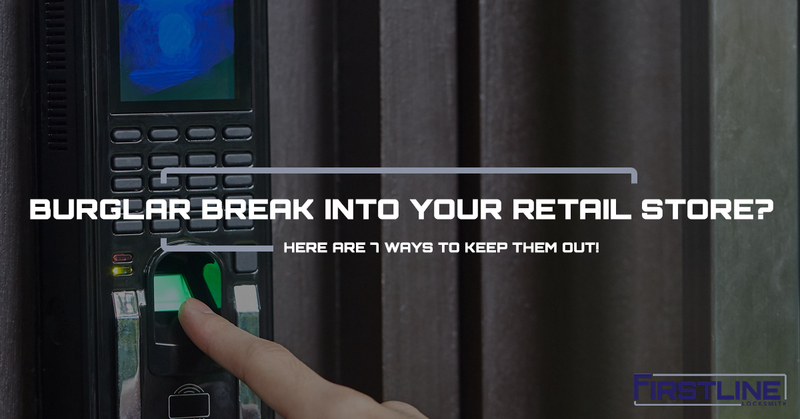 In this post, we’re going to share seven ways you, a retail store owner/operator, can prevent crimes from occurring in your place of business. You want to install a door lock and deadbolt that’s complex enough to deter criminals from even attempting to break in. If they do give your lock a try, you want a high-security setup so that they have little to no chance of succeeding. Most of your employees may deem this micromanagement, but the success and security of your business relies on it. A key count will help you stay one step ahead of a potential burglary. If a key goes missing, then you know it’s time to immediately rekey your locks. It’s important that you take every precaution you can afford to protect your business assets and employees. One way to do this is to install an alarm. Make sure to place stickers and notices where people can see them that you have an alarm installed. This will deter a large majority of burglars scoping out the area for opportunities. When you place potential criminals in the spotlight, they tend to recede back into the darkness. Adding flood lights, motion activated lights, and other illumination in and around your retail business will help deter potential burglaries and thefts. You may be wondering why you need to secure your safe; it’s already locked. Although safes are locked, they aren’t heavy enough, in most cases, to be immobile. Lock your safe behind another locked door or bolt them to the ground for an added guarantee that a criminal won’t try to simply carry the safe away. If a criminal is desperate enough, they will see that your door locks are impossible to get past, and they will go through the glass. You can prevent this desperate measure with burglar-proof glass. In most cases, it’s two glass panes with plastic mesh sandwiched between them. This adds stopping power to the glass and helps protect from direct attacks. Want to secure your retail store in Hamilton but don’t know where to start? Contact Firstline Locksmith today!